NEW: Rockefeller: I will support Daschle's nomination "with vigor"
Daschle emphasizes that tax return mistakes were "unintentional"
WASHINGTON (CNN) -- Democratic senators stood behind Health and Human Services Secretary-designate Tom Daschle Monday after a closed-door session of the Senate Finance Committee on the former South Dakota senator's tax troubles. 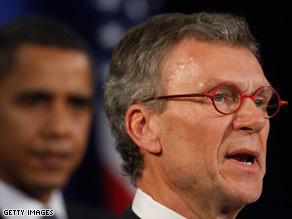 Tom Daschle has been nominated by President Obama to be secretary of health and human services. "Sen. Daschle made mistakes on his taxes," committee chairman Sen. Max Baucus, D-Montana, said after the meeting. "They were disappointing mistakes, but it was clear they were not purposeful mistakes." "Tom Daschle remains imminently qualified to serve as secretary of health and human services," he said. Daschle apologized last week, saying the nonpayment was in error and that he paid the taxes upon realizing the mistake. After Monday's meeting, he repeated the apology. "My failure to recognize that the use of a car was income and not a gift from a good friend was a mistake," said the former Senate majority leader. "When I realized the mistake, I notified officials and I paid the tax in full. "It was completely inadvertent. But that's not an excuse, and I deeply apologize to President Obama, to my colleagues and to the American people." Baucus said the committee would hold a hearing on Daschle's nomination next week and that he would "vote for Sen. Daschle in committee and on the Senate floor." Several other Democratic senators joined Baucus in proclaiming their support, including John Kerry of Massachusetts, Kent Conrad of South Dakota and Jay Rockefeller of West Virginia. "I strongly support the confirmation of Sen. Daschle," Conrad said. "The source of his mistakes were the mistakes of his employer or the mistakes of charitable organizations he contributed to who themselves had not done their work correctly." Rockefeller said he would support Daschle's nomination "with vigor" and said the administration's vetting of the nominee may not have been as thorough as that of the committee. "But everything that was disclosed was disclosed by Tom Daschle himself," he said. The support came after Daschle expressed regret to the Senate leaders over the issue, which was dogging his nomination. Daschle said he is "deeply embarrassed and disappointed by the errors that required me to amend my tax returns," in a letter dated Monday to Baucus and Sen. Chuck Grassley, R-Iowa, the lead Republican on the Senate Finance Committee. The letter was provided to CNN. "I apologize for the errors and profoundly regret that you have had to devote time to them," Daschle said in the letter. The Obama administration has set a high bar of ethics and transparency for its members, and the news of Daschle's troubles sparked concerns from the Republican side of the aisle. Grassley said Monday he has mixed feelings about Daschle's failure to pay certain taxes. "I have a high level of concern about how it looks to the public," he said. "I don't have a level of concern about how it affects his ability to be HHS secretary." He said he's most concerned about President Obama's vetting process, commenting -- seemingly a bit sarcastically -- that Obama otherwise is a "genius." Grassley and other Republicans did not speak after the Monday afternoon meeting. Grassley said he wouldn't decide whether to support Daschle until after the hearing. White House Press Secretary Robert Gibbs said President Obama still stood behind his nominee. "We believe that the committee and the Senate as a whole will examine not just one mistake in a career, but look at that longer three-decade career of public service, of serving this country, serving the constituents both in South Dakota and across America," Gibbs said.